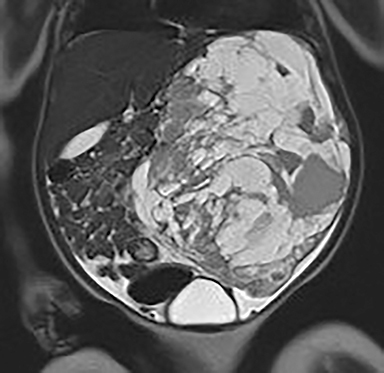 A 6-month-old infant presented with increasing abdominal distention over several weeks and was found to have a large heterogeneous mass arising from the left kidney. The patient underwent a left radical nephrectomy, with pathology consistent with congenital mesoblastic nephroma. Several days following surgical resection, the patient developed diffuse abdominal distention. Dilated small bowel loops on abdominal radiographs were thought to reflect an ileus due to recent surgery. On postoperative day 12, MR angiogram of the renal arteries was performed due to persistent hypertension, and revealed a right lower quadrant ileocolic intussusception, confirmed on subsequent ultrasound examination. Air enema intussusception reduction attempt was unsuccessful, and subsequently, an exploratory laparotomy was performed with successful reduction. The patient recovered well and was discharged home shortly thereafter. 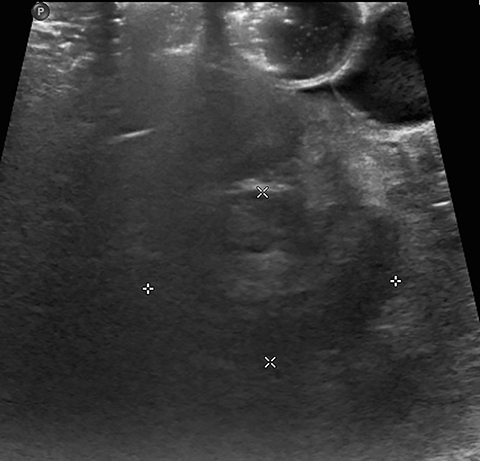 Initial abdominal radiograph on presentation demonstrates a large soft tissue mass in the left abdomen (Figure 1a), corresponding to a large heterogenous mass, which appears to be arising from the left kidney on ultrasound (not shown), confirmed on subsequent MRI of the abdomen (Figure 1B). 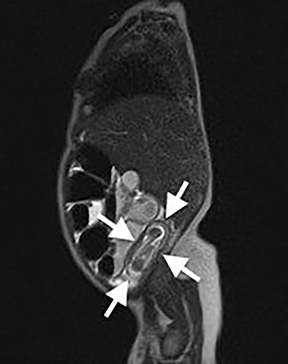 Following left radial nephrectomy, MRI was performed to evaluate for renal artery stenosis, which revealed a right lower quadrant ileocolic intussusception (Figure 2), confirmed on subsequent ultrasound examination (Figure 3). Postoperative intussusception (POI) is an uncommon complication in children, which can occur after any type of surgery. POI can be a challenging diagnosis for both surgeons and radiologists, usually presenting with atypical symptoms and most commonly occurring in the small bowel. POI should be considered in cases with prolonged adynamic ileus following surgery. Awareness and early diagnosis are key to reducing the morbidity associated with POI. Yang G, Wang X, Jiang W, Ma J, Zhao J, Liu W. Postoperative intussusceptions in children and infants: a systematic review. Pediatr Surg Int. 2013;29:1273-1279. doi:10.1007/s00383-013-3345-3351. Mollitt DL, Ballantine TV, Grosfeld JL. 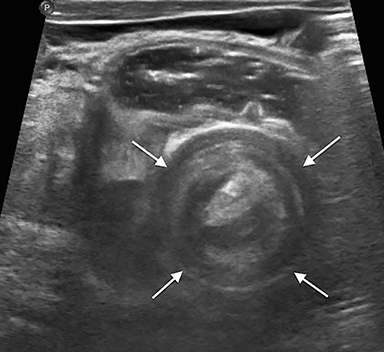 Postoperative intussusception in infancy and childhood: analysis of 119 cases. Surgery. 1979;86:402-408. Allbery SM, Swischuk LE, John SD, Angel C. Post-operative intussusception: often an elusive diagnosis. Pediatr Radiol. 1998;28:71. Navarro O, Daneman A. Intussusception. Part 3: Diagnosis and management of those with an identifiable or predisposing cause and those that reduce spontaneously. Pediatr Radiol. 2004;34:305-312. Kaste SC, Wilimas J, Rao BN. 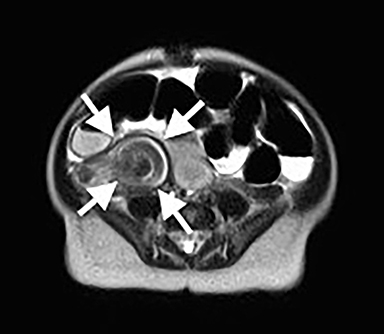 Postoperative small-bowel intussusception in children with cancer. Pediatr Radiol. 1995;1:21-23. Klein JD, Turner CG, Kamran SC, Yu AY, Ferrari L, Zurakowski D, Fauza DO. Pediatric postoperative intussusception in the minimally invasive surgery era: A 13-year, single center experience. J Am Coll Surg. 2013;216:1089-1093. doi: 10.1016/j.jamcollsurg.2013.01.059. Jane S. Kim, MD; Jeannie Chun, MD; Wendy Kim, MD; Cara Morin, MD, PhD; Narendra Shet, MD. 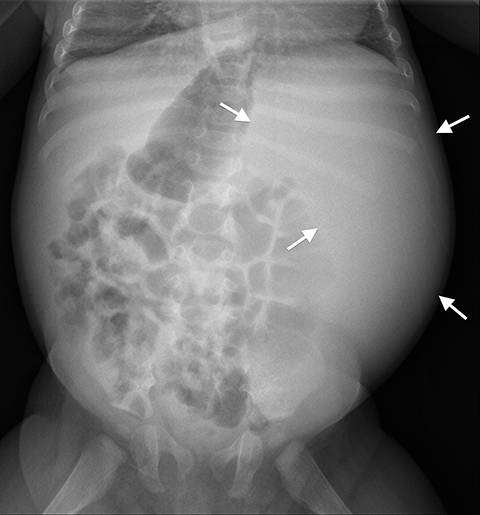 Pediatric postoperative intussusception. Appl Radiol. 2017;46(7):32-33. Prepared by Dr. Jane Kim and Dr. Shet while serving as Assistant Professors in the Department of Diagnostic Radiology & Nuclear Medicine; Dr. Chun while an Assistant Professor in the Department of Surgery, Division of Pediatric Surgery; and Dr. Wendy Kim and Dr. Morin while Radiology Residents, PGY5, in the Department of Diagnostic Radiology & Nuclear Medicine at the University of Maryland Medical Center in Baltimore, MD.